Happy Birthday, Mr. Bunsen Burner! What’s the best way to start your morning? Aside from a cup of freshly brewed coffee, that is. A few minutes after I got up, I did what I normally do – I turned the laptop on. And I was greeted by a colorful sight – today’s Google Doodle, paying tribute to Robert Bunsen. For sure, this name is familiar to everyone who has taken at least one chemistry class. The German chemist was born on March 31, 1811, making today his 200th birthday! Many a chemistry student probably struggled (and still struggles) with all those contraptions in the lab, and of all those contraptions, the Bunsen Burner is one of the most memorable. So today, Google has decided to remind everyone of this great scientist by creating the Doodle. After the disappointing Harry Houdini Doodle a week ago, this one is definitely an improvement. As far as I can see, it is not interactive, but it does have some animation. 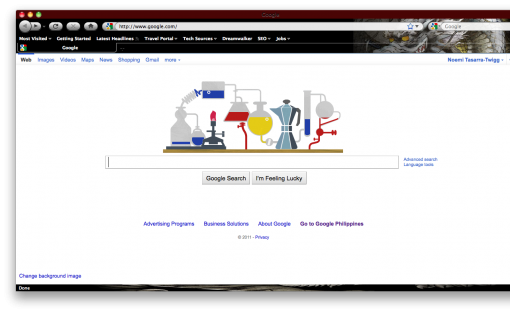 Upon opening Google’s home page, you see a set up that you can normally find in a chemistry lab. The liquids in the image move through the tubes and the containers, to add to the Doodle’s appeal. It’s still not one of the best that Google has come up with, but I suppose it will do. In any case, chemistry enthusiasts might get a kick out of it.